Tonight is the only night of the year many people wear a dinner suit. In the two-part episode of The Saint titled “The Fiction Makers”, Roger Moore wears a three-piece dinner suit, something only Pierce Brosnan to date has worn as James Bond. “The Fiction Makers” was filmed as part of Series 5, so the clothes stylistically follow the others from Series 5, but it was aired in December 1968 as part of Series 6 and later released as a feature film. The midnight blue dinner suit tailored by Cyril Castle has a deep lustre that means it must be made of mohair. The dinner jacket has natural shoulders with roped sleeve heads. It is a button one, with the button elegantly placed low about two inches below Moore’s natural waist. The narrow midnight blue satin shawl collar gently rolls down to the button and lacks the belly of a typical shawl collar. The dinner jacket follows black tie tradition with jetted pockets and no vent. The cuffs button three and have midnight blue satin gauntlet cuffs. All of the buttons are covered to match the lapels. The button three waistcoat matches the midnight blue mohair dinner jacket and also has midnight blue satin silk shawl lapels. The buttons are spaced apart a little more than they traditionally are on an evening waistcoat—about 2″ apart like on a regular daywear waistcoat instead of 1.5″ inches apart—making the front a little taller. It’s commonly said that waistcoats go better with peaked-lapel dinner jackets and cummerbunds go better with shawl-collar dinner jackets. The formality of the waistcoat does indeed better match peaked lapels, and the angular shape of the waistcoat “V” complements the angles of peaked lapels. But there’s also nothing wrong with wearing a waistcoat with a shawl-collar dinner jacket. A U-shaped waistcoat goes well with a shawl collar dinner jacket, though Roger Moore’s waistcoat has a regular V-front. However, Moore’s waistcoat has rounded shawl lapels that match the dinner jacket’s shawl collar, helping to connect the two pieces. The waistcoat’s straight bottom also does away with the angles the typical waistcoat has at the bottom, helping it to better complement the shawl-collar dinner jacket. The trousers, of course, match the dinner jacket and waistcoat. The trousers have tapered legs, cross pockets and a midnight blue satin stripe down the side of each leg. The white dress shirt has a spread collar, double cuffs and a pleated front with mother-of-pearl buttons down the placket. Moore’s bow tie is midnight blue satin silk to match the facings on the dinner suit. Overall, a good dinner jacket that I wouldn’t be embarrassed to wear. That said, there are details about it I don’t like so much. 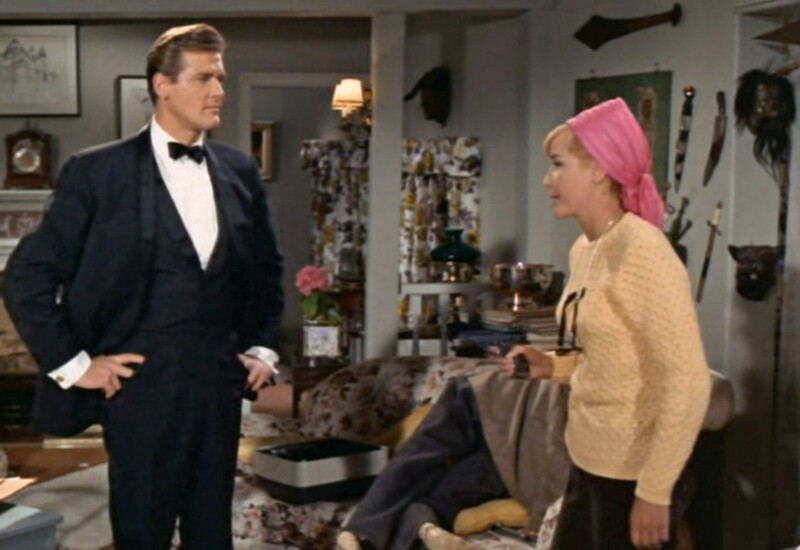 The wider collar on the dinner jacket in To Catch a Thief looks more proportionate for sure. 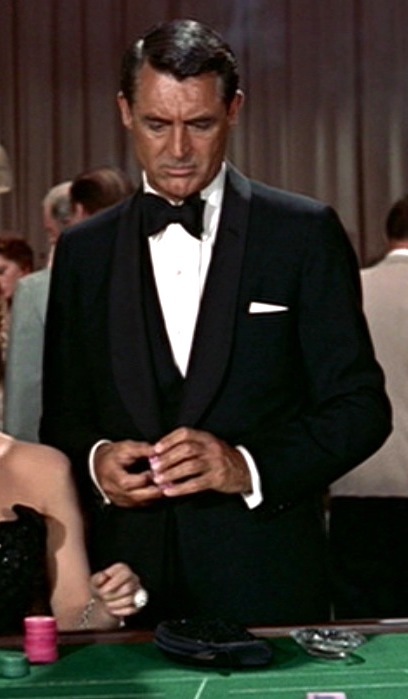 But I don’t think the lapels on Cary Grant’s waistcoat are much wider than the ones on Moore’s. However, I think the first and last photos demonstrate how important it is to keep a dinner jacket fastened, as the effect is somewhat diminished. Is it just me or does it look a bit too full in the chest? A one button naturally will be a bit fuller but I think the placement of button and cut on this, with the shawl only accents the issue. Cyril Castle’s jackets are all cut with a very full chest, but they don’t look as good open. 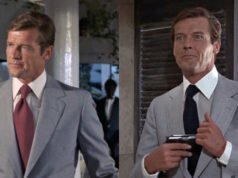 I’ve appended a screenshot of the brief second Roger Moore wears it closed and it looks like any of the other jackets Roger Moore wears. Button one isn’t naturally any fuller than a button three. This jacket actually has less drape than some of the other ones Moore wears in The Saint. Cyril Castle cut his more formal suits with less drape than the more casual ones. His lighter-coloured suits have more drape. Nice idea and colour overall but like Hal, some aspects I don’t care for and Moore’s Bond evening wear including Castle was nicer overall to my eye. The lapels here are too, too narrow and personally I prefer the notch or peak varieties. I sense a general bias in favour of narrow lapels perhaps because they look more “current” whereas there seems to be an overall permanent bias against the wide ones that came a few years after this era here. The jacket’s sleeves look too short in the last picture. They aren’t too short. You can see they are bunched up and caught on the shirt cuff, since he was just in a fight. Nice overall. 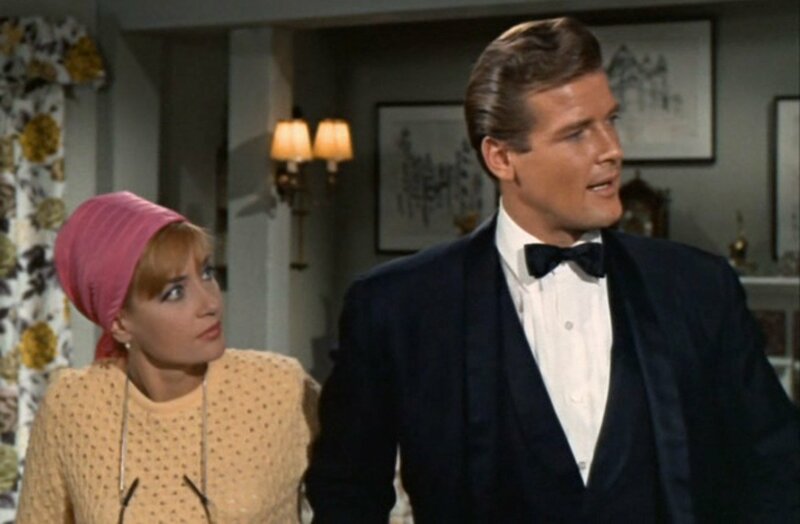 Very reflective of 1967-1968, and, while I prefer a shawl, I do think the lapels are too thin for Roger’s physique. 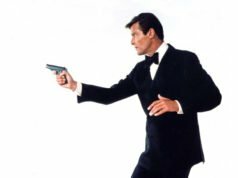 Too bad Connery did not wear a tuxedo in a Bond film filmed in those years- the comparison would be interesting. 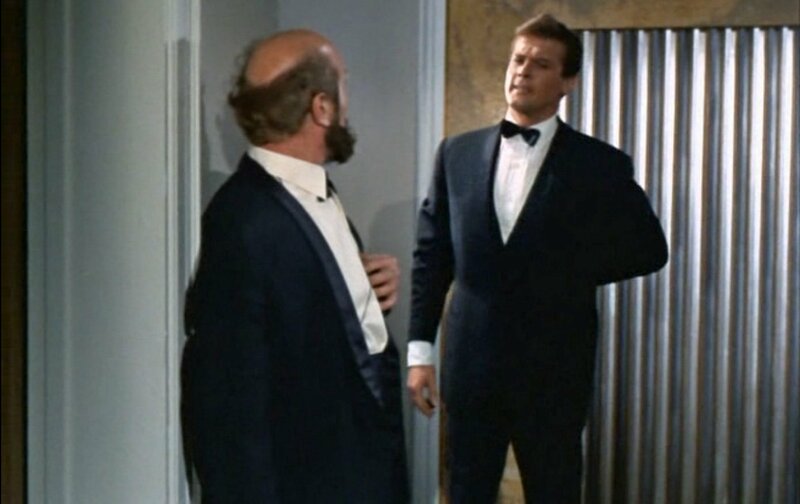 A bit unfair to compare it to Grant’s tuxedo 12 years earlier. If nothing else, this jacket looks cheaper than Grant’s, which was either his personal one or made for him on To Catch A Thief’s large budget with Edith Head as costume designer. Like Pierce in 1986, these photos make me thankful Roger did not get the role in 1962 or 1968. Despite his being three years older than Connery, his looks, IMO, needed to mature a bit, and his acting of dramatic scenes also got better in his mid-to-late 4o’s. 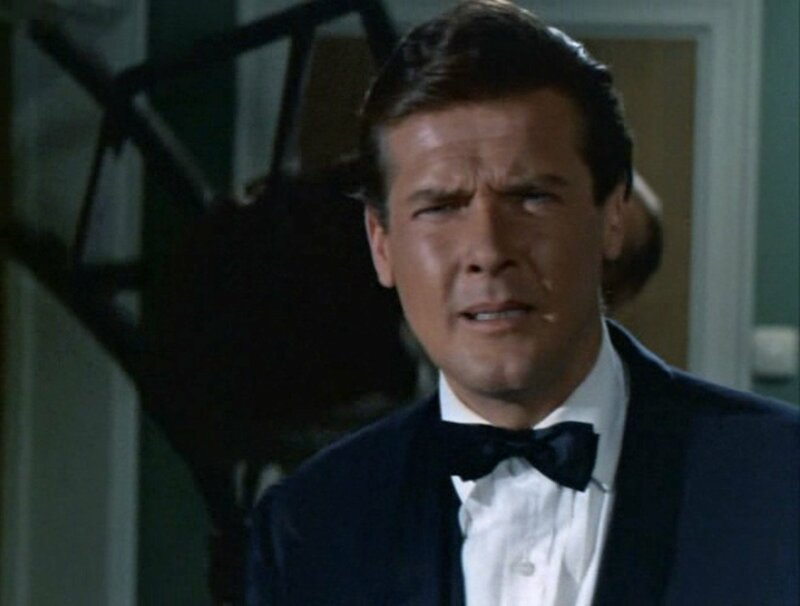 Always a pleasure to see Roger Moore’s “Saint” suits on your entertaining site, Matt. My own prefence would be to leave the waistcoat, the DJ is stylish enough, but R.Moore seemed to like 3 piece suits at this stage on the show. I have 2 Cyril Castle suits myself (unfortunatly not this style) and they really are sublime! Matt.. when are you going to review the Roger Moore “Crossplot” clothes, I believe he wears an even more outrageous Dinner Suit in that one. Once again, thank you for all the work you put in to give us an excellent site!! Geo. Do we get a look of the trousers, Matt ? Perhaps they have a high rise, which could explain the position of the waistcoat, higher than usual. You can see the trousers in the picture at the top.